The Independence of Moldova was officially recognized on March 2, 1992, when Moldova gained membership of the United Nations. The nation had declared its independence from the Soviet Union on August 27, 1991, and was a co-founder of the post-Soviet Commonwealth of Independent States. Moldova became fully independent from the Soviet Union that December, and joined the United Nations three months later. In the new political conditions created after 1985 by the glasnost policy introduced by Mikhail Gorbachev in 1986 to support perestroika (restructuring), a Democratic Movement of Moldova (Romanian: Mişcarea Democratică din Moldova) was formed, which in 1989 became known as the nationalist Popular Front of Moldova (FPM; Romanian: Frontul Popular din Moldova). Along with several other Soviet republics, from 1988 onwards, Moldova started to move towards independence. On August 27, 1989, the FPM organized a mass demonstration in Chişinău, that became known as the Great National Assembly (Romanian: Marea Adunare Naţională), which pressured the authorities of the Moldavian Soviet Socialist Republic to adopt a language law on August 31, 1989, that proclaimed the Moldovan language written in the Latin script to be the state language of the MSSR. Its identity with the Romanian language was also established. The first independent elections for the local parliament were held in February and March 1990. Mircea Snegur was elected as speaker of the parliament, and Mircea Druc as prime minister. On June 23, 1990, the parliament adopted the Declaration of Sovereignty of the Soviet Socialist Republic Moldova, which, among other things, stipulated the supremacy of Moldovan laws over those of the Soviet Union. After the failure of the 1991 Soviet coup d'état attempt, on August 27, 1991, Moldova declared its independence. On December 21 of the same year Moldova, along with most of the former Soviet republics, signed the constitutive act that formed the post-Soviet Commonwealth of Independent States (CIS). Moldova became fully independent from the Soviet Union on December 25, 1991. The following day the Soviet Union ceased to exist. Declaring itself a neutral state, it did not join the military branch of the CIS. Three months later, on March 2, 1992, the country gained formal recognition as an independent state at the United Nations. In 1994, Moldova became a member of NATO's Partnership for Peace program and also a member of the Council of Europe on June 29, 1995. 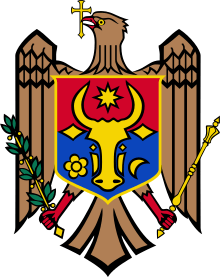 The Declaration of Independence of the Republic of Moldova was a document adopted by the Parliament of the Republic of Moldova following the dissolution of the Soviet Union. The document claims "millenary history" and "uninterrupted statehood" within historic and ethnic borders. The Republic of Moldova gained official recognition of statehood on March 2, 1992, when gaining membership of the United Nations. 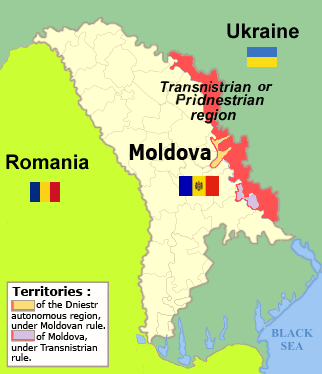 The Moldovan Declaration of Independence clearly and directly claims Moldovan sovereignty over the territory of Transnistria as it is "a component part of the historical and ethnic territory of our people". However, the Moldovan Declaration of Independence is itself used as an argument against Moldovan sovereignty over Transnistria as it denounces the agreement of August 23, 1939, between the government of the Soviet Union and the government of Nazi Germany, the only formal mention of the union between the two territories, "null and void" . ↑ Legea cu privire la functionarea limbilor vorbite pe teritoriul RSS Moldovenesti Nr.3465-XI din 01.09.89 Vestile nr.9/217, 1989 (Law regarding the usage of languages spoken on the territory of the Republic of Moldova): "Moldavian SSR supports the desire of the Moldovans that live across the borders of the Republic, and considering the existing linguistic Moldo-Romanian identity — of the Romanians that live on the territory of the USSR, of doing their studies and satisfying their cultural needs in their native language." ↑ Tiraspol Times; Former ASSR Pridnestrovie reminds Moldova: "You yourself denounced our union"